While Pope Francis continues to be a breath of fresh air in the stuffy closed rooms of the Catholic Church, there is a group of people he seems to be blithely keeping marginalized. A big group. Women. Yes All Women. Aren’t we more than half the world’s population? Aren’t we the ones that have been keeping the faith all these years? But more importantly, aren’t we the ones mostly responsible for passing it on to the next generation as teachers, social workers and mothers? Because women have accepted inferior status in the Catholic Church for so long, we are not important enough to be put on the agenda. The recent Vatican synod on the family barely allowed women to participate. Do we have to patiently be taken for granted for another couple of decades before we are even allowed into the room to ask that our cause be put on the agenda? Well, about a decade ago, some women got sick of waiting. They felt they were called to be priests and they did something about it. In 2002 seven women were ordained priests on the Danube River in International Territory by a Roman Catholic Bishop, their Holy Orders directly descending from Saint Peter. 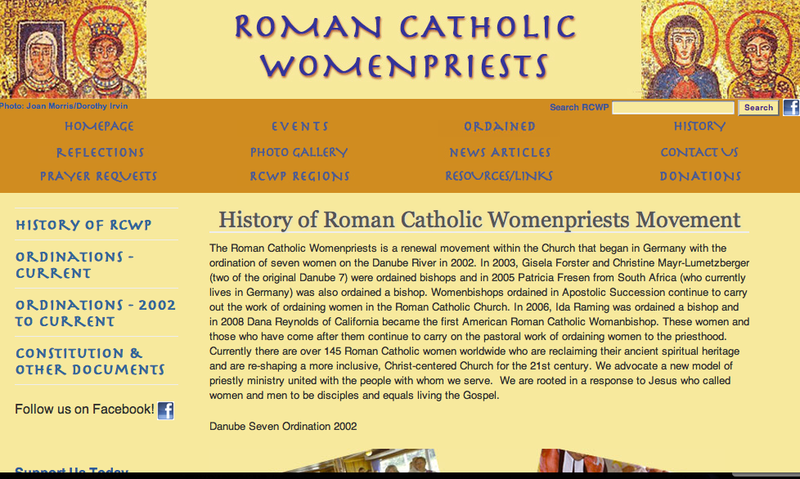 There are about 145 Roman Catholic Women Priests internationally now. Now they have their own female bishops and ordinations take place on a regular basis. 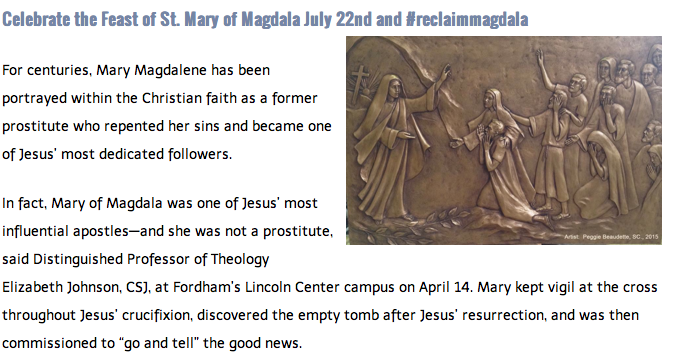 Of course, these women have all been excommunicated from the Catholic Church. In fact, if you are seen at an ordination of women as priests you will be excommunicated too. An elderly nun listened to her calling in April. After serving as a nun for 47 years, Sister Trish Rawles became an ordained priest in the Roman Catholic WomenPriests. And now she is being excommunicated. The link above includes a petition to the Pope to consider all of her years of service and re-instate Sister Trish. But how can Pope Francis reinstate Sister Trish when all the other women priests have been excommunicated? And when it is not possible for Sister Trish to be recognized as a priest in the Catholic Church? Probably the reality is that Sister Trish realized if she wanted to follow her true calling in this lifetime she had to do something radical, and splinter off from the main Church. But signing the petition shows our support for Sister Trish and our acceptance of and plea for this change. Sister Trish’s action in listening to her calling is certainly not an unprecedented way to goad the Church into reform. She follows in the footsteps of many visionaries; Martin Luther to name just one. What is Pope Francis’s vision? Optimistically, he sees this issue and the many others plaguing the Church and is slowly and systematically addressing them, carefully timing reforms, with the help of the Holy Spirit, so the Vatican will be ready and accepting of change. Perhaps Pope Francis is already listening to the hundreds of Catholic Theologians who will tell him that historically there is proof that women in Jesus’s time were active in priestly ministry, and, of course there were married priests. While the Pope can’t turn the Church around immediately, perhaps he has already identified the many important issues that need to be addressed. Maybe they are already on his agenda to begin a Church discussion. There are many organizations that are advocating for these changes, respectfully and knowledgeably like Future Church ‘s advocating “. . . changes that will provide all Roman Catholics the opportunity to participate fully in Church life and leadership.” I am always heartened when I hear a sermon that addresses some of these issues and advocates for accountability in the Church.